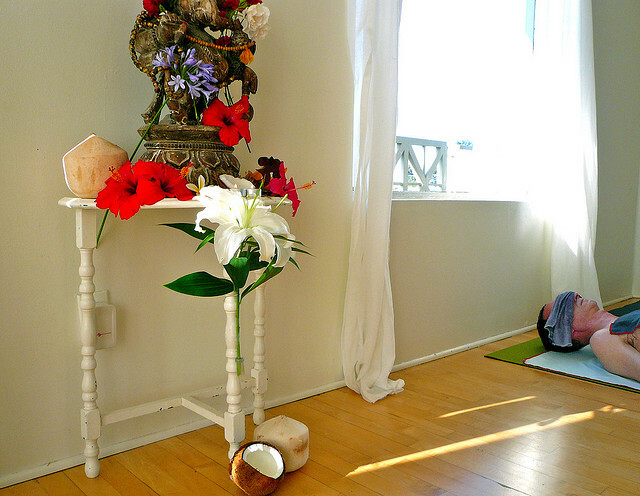 Question of the Week: What do you do to make your Savasana special? As I teach my yoga classes, I try to explain that Savasana is an official yoga pose. It is. Yes. Just lying there, on your mat, relaxing on your back; this is a yoga pose. No twisting or straining; no challenge. And yet, for some, it is one of the hardest poses of all to master. I like to hand out blankets, flax seed/lavender eye pads, and bolsters to add comfort. It is a good idea to ask who would like the props. I have seen first time yoga go-ers lie on their backs with their hands clenched to the sides of their legs (which are also clenched together.) They leave their glasses on. They tend to look like they have never fallen asleep in their lives and asking them to relax is akin to Stephen King movie torture. Keep in mind that I have my own yoga studio and I tend to know my clients’ needs well. Any touches or props in yoga must be first approved by your yoga people. I announce first as Savasana preparation begins, “Who would like an eye pillow? Who would like a bolster under their legs for lower back support?” Sure enough, eventually, even “The Gripper” client will settle in, and eventually open up like a crocus springing up out of the cold, winter ground. I like to joke that Savasana preparation is like getting ready for bed at a Slumber Party. You have all of these props and blankets around you and each person has their own mat plus you all get to lie down together. The only thing missing are the unhealthy snacks and the marathon of movies. Who knows? If it helps people to relax, it could be the next best Savasana technique out there. Share some of your favorite Savasana techniques in the comments below. What brings soul to your Corpse Pose?